Randy Lerner’s decision to sell had been widely expected. 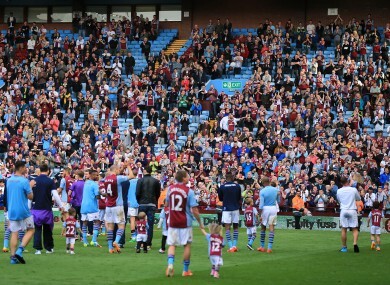 ASTON VILLA’S OWNER Randy Lerner intends to sell the club, he announced today. Lerner took control at Villa Park in 2006 after a £62.6m takeover ($105.7 million). “I owe it to Villa to move on, and look for fresh, invigorated leadership, if in my heart I feel I can no longer do the job,” he said in a statement. “I have come to know well that fates are fickle in the business of English football. And I feel that I have pushed mine well past the limit. “The last several seasons have been week in, week out battles and having now come through this last season unfortunately limping amidst very meaningful injuries and constant sale rumours, I feel further that now is the time for me to look for new ownership and thus new leadership. “I have asked the world of Paul Lambert and Paul Faulkner and they have both delivered selflessly. Villa struggled in the 2013-14 season, finishing 15th in the Premier League, just five points above the relegation places. The announcement from Lerner was widely expected after he said last month he would address speculation about his future after the end of the season. The status of Villa manager Paul Lambert hangs in the balance. Email “For Sale: Aston Villa - Premier league club with Lambert as manager and Lerner as ex-owner”. Feedback on “For Sale: Aston Villa - Premier league club with Lambert as manager and Lerner as ex-owner”.